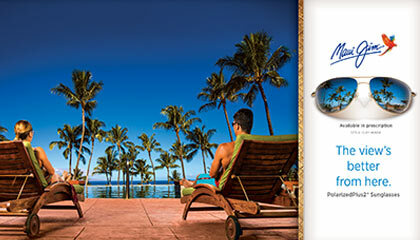 Look through Maui Jim lenses... colours are spectacular. Because there are three rare earth elements inside. And patented PolarisedPlus 2 technology delivers unrivalled polarisation – killing off 99 percent of glare (contrast is sharp too). So there’s no need to squint. Instead, your eyes are comfortable with Maui Jim sunglasses. MauiPure lenses give you clear views like glass lenses... only they’re lighter and tougher. SuperThin glass delivers the greatest clarity (it’s also 20 percent lighter than regular glass).